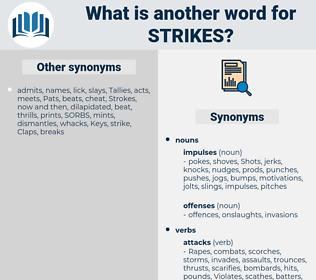 What is another word for Strikes? 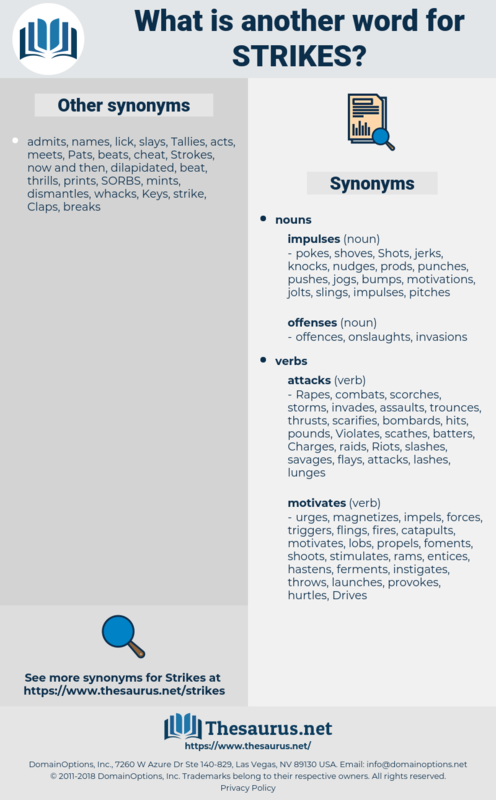 criticizes, crackdown, register, countering, suppress, fighting, fight, fights, tackling, injures, hammers, combatting, sets, shoots, Combating, extends, combat, tackle, assails, cancel, cancels, scores, recorded, Records, jolts, rips, annuls, posts, Floods, brush, rocks, sign, signs, drops, curb, tuesday, Wounds, raps. operations, Strokes, represents, mistakes, struggles, transgressions, brushstrokes, cyber-attacks, repercussions, targeting, Aggressions, condemnations, impactors, Advertisements, sorties, times, explosions, Strains, effects, revolutions, misdemeanours, contraventions, disputes, infringements, Seizures, rockets, experiments, incursions, tactics, crackdowns, Exercises, Tests, assaults, Outbreaks, jobs, Irregularities, shellings, workers, Penalties, tricks, incidents, targets, airraids, alerts, fires, behaviours, onslaughts, exploits, PROSPECTS, sept, indictments, worlds, deviations, distortions, intrusions, disclaimers, encroachments, invasions, attackers, collisions, occurs, shutdowns, accidents, bombers, convictions, setbacks, bursts, admonitions, Opportunities, reporters, Robberies, fucks, acts, aerial, notifications, misdeeds, sentences, throws, troops, unionists, warnings, infractions, marks, Shots, Behaviors, violations, moves, advisories, reminders, Fatalities, failures, innings, wrongdoings, rattles, slaps, outrages, warplanes, gunships, offenses, attempts, battles, homers, fits, Deficiencies, announcements, bits, burns, tries, items, flicks, Atrocities, Torts, events, Keys, crashes, Crimes, varnishes, processes, episodes, raiders, punches, errors, Injuries, points, shores, coups, BRICKS, touches, bullets, shocks, iraq, breaches, iraqi, deals, faults, force, airlines, cautions, INROADS, busts, sins, abuses, gunshots, swings, Missions, launches, Buttons, fouls, chimes, notices, salvoes, offences, failings, Ones, bells, wrongs, needless, forays, odds, chances, caveats, PAROS, birds, is, demands, Beaches, sounds, advices, counts, ADS, rounds, amounts, calls, cuts, Combating, scores, jolts, rocks, Wounds. proposes, disposes, offers, exists, stops, provokes, administers, ascertains, invokes, skirts, articulates, disrupts, stipulates, suggests, illustrates, shakes, implements, transpires, considers, undertakes, discovers, generates, writes, demonstrates, investigates, understands, Guarantees, presents, retains, stays, resides, pinpoints, devastates, constitutes, translates, directs, expresses, reflects, recognises, represents, rises, inspires, reacts, creates, threatens, enters, identifies, seeks, insures, sustains, realises, imposes, evaluates, introduces, responds, maintains, accomplishes, Kicks, operates, eliminates, delivers, preserves, arises, stabs, Addresses, encounters, afflicts, describes, seems, prescribes, enacts, depicts, enshrines, regulates, penalises, presupposes, interferes, pertains, determines, infects, prepares, respect, respects, intends, influences, calculates, wears, confronts, appears, prohibits, contends, keeps, suffers, arrives, prevails, concerns, coverage, protects, encompasses, removes, entrenches, raises, secures, compromises, acknowledges, experiences, feels, receives, assesses, finds, attained, attains, governs, Affects, Institutes, explains, relates, configures, derives, Leaves, produces, indicates, remains, combats, coincides, envisages, assigns, invades, confers, Violates, Permits, achieves, sweep, sweeps, realizes, crosses, displays, observes, preys, tackles, encroaches, obtains, compiles, highlights, declares, ensures, contains, impairs, recognizes, discusses, formulates, submits, earns, specifies, serves, elaborates, opens, holds, emerges, Bears, infringes, monitors, diminishes, seals, pursues, hurts, stands, arouses, completes, takes, succeeds, refers, enjoys, jeopardizes, contributes, informs, satisfies, poses, drafts, undermines, collides, performs, thinks, title, impinges, pummels, inquires, touch, yields, reveals, believes, facilitates, concludes, proves, conducts, manages, argues, passes, continues, defines, incursions, adheres, affirms, Met, meets, brings, Comes, assumes, affords, assures, tends, aims, lies, charts, spends, lays, conveys, amazes, erodes, covers, outlines, contrary, embodies, fulfils, fails, offends, turns, fulfills, declines, states, builds, involves, damages, cares, engages, causes, Plays, adopts, sees, harms, fires, sends, signals, entails, handles, enforces, looks, fixes, reads, draws, asks, upholds, happens, follows, hampers, implies, leads, sums, applies, adds, clarifies, forges, Carries, falls, occurs, blames, heading, Chops, attaches, enables, Worries, says, Lends, Focuses, focusses, becomes, wins, Faces, Gives, marks, moves, runs, goes, rattles, gets, tries, lets, puts, places, processes, Gains, POPS, makes, N, touches, helps, means, breaches, deals, allows, swings, is, Does, sounds, amounts, calls, criticizes, injures, hammers, sets, shoots, extends, assails, jolts, rips, posts, drops, Wounds. bombardments, sit-ins, offensives, stoppages, shootings, beatings, blows, IMPACTS. The sun strikes me down. It strikes me solemn to think of it. storage, streak, schistorrhachis, soak through, secateurs, strix, sitotroga, storax, styrax, squeak through, sidetrack, store cheese, satirize, sagittarius, styracaceae, staircase, satiric, scatter rug, starchy, satyric, starch, strachey, see-through, storehouse, Skeeter Hawk, struck, stark, studhorse, Starkey, strake, stroke, stork, strauss, stairs, siderosis, stearic, steerage, satyriasis, sistrurus, see through, sheetrock, stargaze, Scut Work, satureja, side horse, stirk, steerageway, stress, streaky, satirise, Saiga Tatarica.